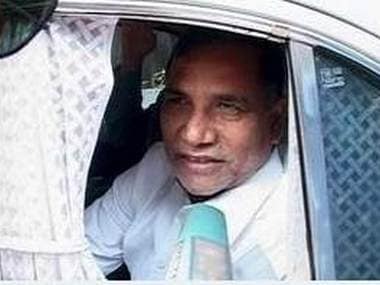 Mumbai: Beleaguered Mumbai Congress leader Kripashankar Singh, facing charges of amassing illegal wealth, today said he had done nothing wrong and will fight "as per law". "I am not guilty. I am not absconding. I have done nothing wrong," Singh said. On his son Narendra Mohan making an obscene gesture at the media yesterday, he said, "What my son did was wrong and I apologise on his behalf... However, the media targeting me and my family is also wrong," the former Maharashtra minister said. "I do not own those many properties as are being shown," the MLA from Santa Cruz area of Mumbai said. The Economic Offences Wing of Mumbai Police yesterday attached 12 properties of Singh and his family in the metropolis, three days after lodging an FIR against them for possessing assets disproportionate to their known sources of income. "The allegations have wrecked my political career," the Congress leader said, adding a PIL (which led to the filing of FIR) alone cannot be used to level charges against him. The Supreme Court had yesterday refused to grant him any immediate relief from action in the corruption case.